Mitochondrial damage or dysfunction contribute critically to the pathogenesis of various diseases, including AKI. 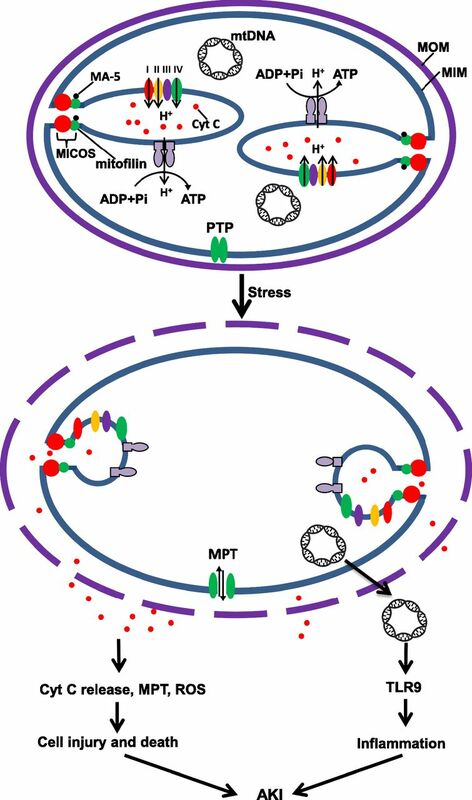 Upon stress, mitochondrial dynamics are disrupted and membrane integrity is compromised, resulting in the release of apoptogenic factors, mitochondrial permeability transition (MPT), loss of membrane potential, energetic failure, and reactive oxygen species production to induce cell injury and death. In this issue of the Journal of the American Society of Nephrology (JASN), Tsuji et al.1 unravel a pathogenic role for mitochondrial DNA (mtDNA) in septic AKI via Toll-like receptor 9 (TLR9), and Suzuki et al.2 identify mitochonic acid 5 (MA-5) as a renoprotective agent in ischemic and cisplatin-nephrotoxic AKI through binding mitofilin to facilitate ATP synthesis. An in-depth investigation into mitochondrial biology and pathology is essential to the discovery of effective therapeutics to protect kidneys from injury and enhance kidney repair and recovery. Mitochondrial damage and dysfunction are recognized as a major pathogenic events in a variety of diseases, including both chronic and acute kidney diseases.4,5 In AKI, mitochondrial damage contributes critically to sublethal and lethal injury of kidney tubules, and the consequent loss of renal function. In various models of AKI, mitochondrial dynamics are disrupted, resulting in mitochondrial fragmentation, membrane permeabilization, mitochondrial dysfunction, energetic failure, and ROS production (Figure 1). Notably, preservation of mitochondrial dynamics, prevention of mitochondrial membrane permeabilization, and/or promotion of mitochondrial biogenesis can protect kidney tubular cells and tissues in AKI.6–8 As such, targeting the mitochondria has been proposed as a therapeutic strategy. Two studies1,2 in this issue of the JASN have significantly advanced our understanding of the mitochondrial contribution to AKI. Critical Role of mitochondria in AKI. (A) In unstressed, healthy mitochondria, the integrity of both MOM and MIM is maintained to retain cytochrome c (Cyt C) in cristae and mtDNA in matrix. MICOS, including mitofilin, preserves the cristae structure and regulates the activity of ATP synthase. The newly identified MA-5 binds to mitofilin to facilitate ATP generation via ATP synthase (Suzuki et al.8). (B) Upon stress, mitochondria become permeable at both MOM and MIM, leading to the release of cytochrome c, MPT, loss of membrane potential, inactivation of ATP synthase, and production of ROS for cell injury and death. Dying or dead cells release mtDNA to activate systemic inflammation via TLR9 to further induce AKI (Tsuji et al.7). H+, proton; Pi, phosphate; PTP, permeability transition pore. In the second study, Suzuki et al.2 demonstrate the protective effect of MA-5 against kidney and cardiac injury. MA-5 is a synthesized indole acetic acid derivative that was recently identified for its effect on increasing cellular ATP and survival in fibroblasts from patients with mitochondrial disease.11 Suzuki et al.2 have now further verified the protective effect of MA-5 in both ischemic and cisplatin-nephrotoxic AKI. Moreover, MA-5 was protective in the novel model of “mitomice”, which have mutations in mtDNA. Remarkably, MA-5 increases ATP production without significantly affecting the activity of respiratory complexes. So, what is the mechanism of action? A series of biochemical studies suggested that MA-5 binds specifically to mitofilin (Figure 1), a core component of the so-called mitochondrial contact site and cristae organizing system (MICOS).12 Structurally, mitochondria consist of four compartments: MOM, MIM, intermembrane space, and matrix. Although MOM forms a barrier to the cytosol, it is permeable to small molecules, including water and ions. The permeability of the MIM, however, is much more restricted, resulting in the maintenance of the proton gradient that creates the membrane potential for ATP synthesis via F1Fo-ATP synthase (sometimes called complex V). Notably, MIM consists of two morphologically and functionally distinct domains: the inner boundary membrane and the cristae membrane. The inner boundary membrane and the cristae membrane are connected by the crista junction, which forms a barrier that limits the movement of proteins and metabolites between the intracrista and the intermembrane space, as well as between the inter-boundary membrane and cristae. Functionally, the crista junction has been implicated in the modulation of the proton gradient across the MIM to regulate oxidative phosphorylation. A recent, important development in our understanding of mitochondrial biology is the discovery of MICOS, a conserved hetero-oligomeric protein complex at the crista junction that functions as the organizing center for the crista junction, the cristae, and the overall architecture of the MIM.12 At the core of MICOS is mitofilin (or MIC60 according to recently agreed nomenclature12), which provides the docking site for the association of several MICOS proteins and regulates mitochondrial dynamics via OPA1, as well as ATP production via F1Fo–ATP synthase. Suzuki et al.2 showed that MA-5 accumulates in the mitochondria and binds to mitofilin, but intriguingly it does not affect the activity of respiration complexes I –IV. On the basis of these findings, Suzuki et al.2 postulate that MA-5 promotes the oligomerization of F1Fo–ATP synthase to increase ATP generation. In support of this theory, previous work suggested that Fcj1 (a yeast homolog of mitofilin) prevents F1Fo–ATP synthase assembly.13 Although this is a logical possibility, MA-5 might also affect mitochondrial activities through mitofilin and MICOS. In particular, it might prevent the disruption of mitochondrial dynamics and consequent mitochondrial fragmentation, which is known to contribute to cell injury and death in ischemic and nephrotoxic AKI.6 With this in mind, future studies should examine the effect of MA-5 on the ultrastructure and dynamics of mitochondria pertaining to cell death under pathogenic conditions to gain further insights. The studies by Tsuji et al.1 and Suzuki et al.2 provide further support to the concept that mitochondrial protection is an effective therapeutic strategy for diseases such as AKI. The genetic and pharmacologic inhibition of the mitochondrial pathway of apoptosis rescues tubular cells to protect against AKI.3 Additional mitochondria-targeting therapeutic strategies include the prevention of MPT, preserving mitochondrial dynamics, antagonizing mitochondrial oxidants, and promoting mitochondrial biogenesis, to name just a few, and mitochondria-targeted antioxidants (e.g., MitoQ, CoQ10, SkQ1, SkQR1, and Mito-CP), the peptide bendavia (SS-31), and mitochondrial fission inhibitors, confer beneficial effects in various experiment models of AKI.3–5 Despite the expanding list of mitochondria-protecting agents, their translation into clinical use remains a big challenge, largely because of their potential side effects and unclear mechanism of action. For example, cyclosporin A exerts protective effects by blocking MPT, but its nephrotoxicity limits its use in kidneys. Rapamycin, an mTOR inhibitor, protects against AKI by promoting autophagy and mitophagy14,15, but might also suppress kidney repair and recovery following AKI. Thus, more specific and efficacious approaches are needed to target mitochondria for renoprotection. Future in-depth investigations into mitochondrial biology and pathology are essential to the discovery of novel therapeutics for disorders caused by mitochondrial damage and dysfunction, including both chronic and acute kidney diseases. The work of the authors was supported in part by grants from the National Natural Science Foundation of China (81430017, 81370791), the National Basic Research Program of China 973 Program No. 2012CB517601, and the National Institutes of Health and US Department of Veterans Administration. See related articles, “Mitochonic Acid 5 Binds Mitochondria and Ameliorates Renal Tubular and Cardiac Myocyte Damage,” and “Role of Mitochondrial DNA in Septic AKI via Toll-Like Receptor 9,” on pages 1925–1932 and 2009–2020, respectively.